Hi there... Quick post for today. At last minute I decided to do the Mojo Monday challenge. Took me awhile to figure out which stamps I want to use. 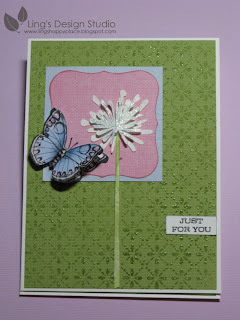 I ended up using this old Stampin Up! Feathered Hope set. It's one of my favorite. 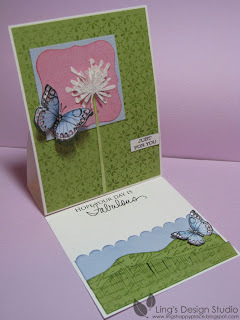 I also used PTI Petal Flowers, Hero Arts Dots and Flower, and the greeting is from Hampton Arts Celebrate and Thanks set. Yesterday, I was cleaning my scrapbook room (although if you look at my desk, it doesn't seem like I do any cleaning) and get rid of stuff that I don't want to use anymore. But, I also found my old fiber stash. I used to love using fibers for little details. And that's what I did with this card. Do you see the worm? I used 2 piece of threads for the worm. It just a small detail, but enough to add a little texture and excitement to the card. 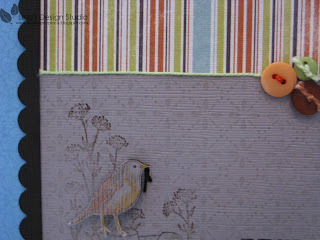 :) I also add fibers for the border on top and bottom of the center image. Do you have any old stuff that you used to use for your card or scrapbook that you haven't use? Maybe it's time to dig it out. :) Happy Sunday, everyone... Hugs, Vera. You guys who are so kindly taking the time to visit my blog, you don't know how much your thoughtfulness means to me. Thank you all for your super sweet comments for my post yesterday. Everybody is so loving and supportive. It truly warms my heart reading all your comments. Karen's comment about her dad was so sweet. How true that we always remember the small everyday kind, loving things that our loved ones used to do for us. Speaking about being thankful and grateful, each year, as we're getting ready for the Chinese New Year, my mom usually do some kind of praying or meditation to thank God for all the blessings from the previous year and to say our hope and prayer for the coming year. This year, I do it with her since she's here with me and gosh, when you quiet yourself and just think of all the things you're grateful for, it's amazing how rich you feel. Yesterday, I as feeling a bit blah. It was 8 years ago on January 27, 2002 that I lost my dad. And when my brother emailed me about it, well what do you know... I still cry my eyes out. Every year, we email each other and remember the good times. And being a daddy 's girl, I think no matter how old I am, I'd always miss him. He was a man who loves to joke around and have this big belly laugh when he laughed. We miss that laugh. And I miss going shopping with my dad. He's one of kind. A man who actually love shopping! My SIL told me how one time he went to visited them and she spent the day went shopping with him and all her friends were like, what?? I thought that was cool. :) Wherever you are dad, I love you and I miss you. Anyhow, so I was dragging my feet the whole day. Just not feeling it, you know. Then, when I came home from work... guess what waiting for me on the front door? My new Paper Trey Ink stamps and my Nestabilities label die cuts!!! Yay.... Rush through the door and tore open the package. That's my first big smile for the day. :) I've been drooling over PTI stamp for awhile and to finally have those stamps in my hand... heaven... LOL, okay, heaven on earth. Loved, loved the stamp. I bought 4 sets and already itching to get more. I was so giddy, I don't know what to make. I am still brainstorming. Too many ideas. But, I did make this cute card inspired by Nancy's card here. The dandellion is cut with Silhouette in 2 different size. Cover the top one with diamond stickles. The butterfly also has some glitters on the wings. Background and butterfly are from Hero Arts. I love this background. Make everything looks classy instantly. I rarely do complete card inside out, but this is one. Use my new PTI stamp for the inside greeting. LOVE this set. The grass, did you see the detail on the grass? I cut the stripes so it has more texture. Thank you Nancy, for the inspiration! I am in love, people!!! With a little birdie from Silhouette. This bird is just so darn adorable, I can't stop myself. :) First thing first, my source of inspiration is Lucy Abram. She has the most impeccable taste in card making. I love the clean look of her cards, yet her cards is very creative. Well, she made this card using some birdies with musical note and as soon as I saw it, I just know I have to make some birdie cards. 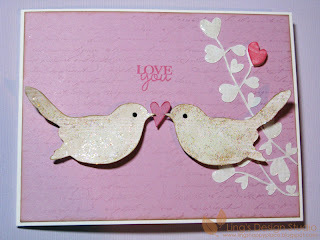 So, I made this super duper cute cards, if I may said so myself, for Lucy's glitter challenge. And, guess what, turned out this card would be perfect for Virginia's Beat the Winter Blah challenge. Virginia is another talented lady from the Hero Arts flickr group. I have unlimited source of inspiration. That's my wish for all of you. :) How are you all doing today? I am in that dangerous shopping mode. Been itching to get some more new stamps (not that I need more stuff in my scrapbook room). I am debating myself on which stamp I should get. I am thinking of getting some from Paper Trey Ink, since I don't have any of their stamp, yet. But, theirs are pretty pricey. So, we'll see as I continue my search. What's your latest stamp purchase? Share your ideas, anyone??? 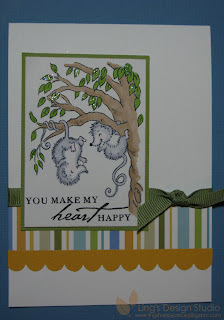 After my previous card, I think I fall in love with vellum all over again. 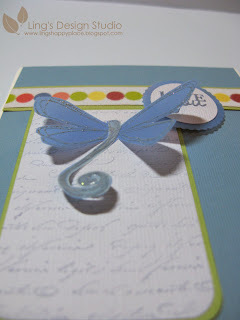 Vellum is so perfect to create soft fluttery wings. 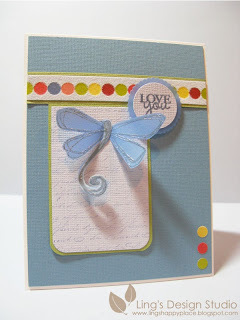 This time, for Mojo Monday challenge, I go with blue and light blue vellum. I have this Magenta dragonfly stamp for the longest time and I think I only used it once before??? I bought it, because I love the way it looks and afterward, just never quite get the inspiration to use it. But now.... I'll find more ways to be creative with it. Lucy's challenge really get me going with the monochromatic theme. There's something to be said about using monochromatic color. It just looks pretty. So, I made 1 more monochromatic color card. Vellum always fun to use, especially for wing related items. They create the soft and elegant look. And talking about old stuff, the stamp I used is from Magenta. Not sure if the company still around, but I remember in early 2000 I used to find their stuff at the scrapbook expo, etc. 1. 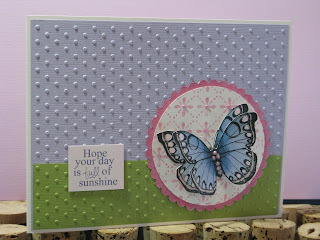 Using Cuttlebug, I dry embossed the vellum paper for background. Attached to card. I only glued the part that's behind the circle. 2. 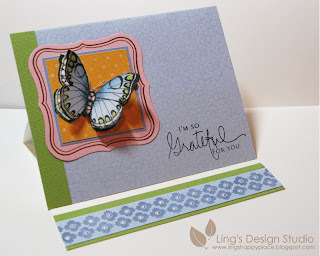 Cut a circle from soft green cardstock and stamped with the old writing. I used Versamark olive green ink. 2. Attached the 1st circle to the scallop circle. 3. Attached a strip of ribbon before you attched the circles. 4.For the dragonfly, stamped it twice on a piece of vellum, cut both stamped image following the shape. Glued one of top of one another, to create dimension. Only glued the body part and creaed the wing part so it looks like it flutters. 5. 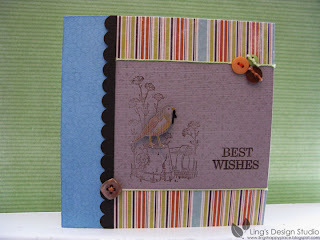 Stamped greeting and add button. Voila... you're done. I might have to give the vellum more try. It was fun to be able to use old stuff for something new. Thank you all for stopping by and please leave a comment while you're here. Hugs..., Vera. Do you have a bunch of scrap papers? I have boxes of scraps and as much as I try to sort through them and thought of throwing some away, I have a hard time parting ways with my scraps. First of all, I don't like to waste stuff. I am into saving the planet. And second, I feel challenged, too. I keep thinking, surely there's something I can do with them. :) Anyhoo... that's what I do with this card. Strictly made with leftover stuff. 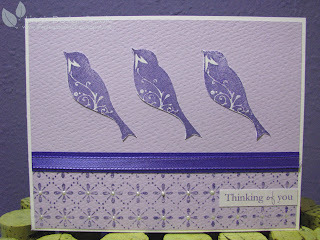 I stamped the birdies on my white scrap papers. With my white paper, if there's space to be stamped, you can bet I'll try to utilize it. The background also leftover paper and the ribbon, too. On the background paper, I stamped only 1/3 of the bottom with Hero Arts Flower & Dots stamp, then I glued a strip of cardtsock to cover the transition area and add ribbon on top of the strip for extra texture. Do you guys love challenge? Who's challenge do you usually do? Please share the link. It's always fun to find new challenge. That's all for now and may your day be a blessed one. Oh my gosh, this morning it was 26 degree here. That's the lowest I ever experience since I moved to Houston in 1995. For those of you who's used to winter you probably think it's only 26. Heh... Come on, I am a tropical girl, so this is super cold for me. If it's gonna be this cold, I'd at least would like to see some snow (I have a feeling, my mom doesn't agree with this...). To make me forget about the cold, I made this cheerful owl card. Stamp is from Rachelle Anne Miller collection. I colored the owls with Copic markers. Add stickles glitter to the caterpillar and the snowflakes. Really love this sentiment "Anytime Message" set from Hero Arts. This set is so versatile and have lots of message for all kind of occasion. Note, posted after I published the blog: Yep, just found out I missed the dateline again. Aarghh... Oh well, it's still fun to make this card. Here's my first card for 2010! On top of the Christmas hustle and bustle, my MIL and my mom both have their birthday close to each other, right after Christmas. So, this past month, I've been busy working on an album for each of them. 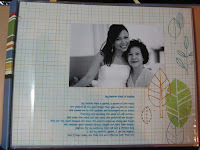 For my MIL, I made an 8x8 scrapbook and for my mom I made an 11X8.5 scrapbook. The one for my mom was kind of hard for me to work on it without her knowing. She comes all the way from Indonesia and I don't want to just ignoring her by keep working on the album. Besides, she'll get suspicious. :) One night, hubby also get involved and keep her company and watch Hotel for Dogs with her, just so I can finished up the album. Love my hubby. So... thoughful and kind. :) Like my mom said, I am very lucky. My mom's album is basically about her trip to the US this time (except for the cover page & I put one of my favorite poem about mother). 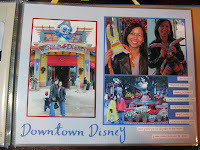 So, I printed out the photos from Thanksgiving and our Disneyworld trip and just make a pretty simple album. I decided simple but done is better than fancy but only 2 pages done. Here's a couple of the pages from the album. (I actually tried to load 5 pages, but somehow the other 3 keep coming up the wrong way). Well, things still a bit hectic, but one of my New Year's resolution is to maintain my blog more consistently. Hopefully, I can do much better this year. And, I do like to domore scrapbooking this year. My boxes of photos is growing and I better catch up. Here's to 2010. May this year be filled with joy, peace, happiness and beautiful blessings for all of you. Thank you all for your support and kindness. This blog is keep going and growing because of you all.